I recently received a review copy of another book in Eric Reis's Lean series, UX for Lean Startups: Faster, Smarter User Experience Research and Design . In this book, with a lively, if somewhat irreverent, tone, Laura Klein guides you through the process of using UX as a gateway into finding a market and, eventually, success. This book has pragmatic advice on what to do and how to do it now, and, more importantly, what not to spend time on. Not just a concept book, this book discusses tools and detailed approaches. Klein addresses many of the concerns people might have about "skipping steps" in order to be lean, and explains the both the challenges and benefits of a lean approach to UX design. The author discusses how UX fits into an agile startup environment. 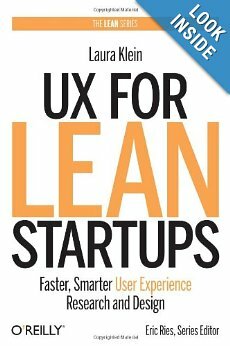 UX For Lean Startups has a slightly different audience than the earlier, similarly titled book Lean UX: Applying Lean Principles to Improve User Experience . Looking at the books, it's a bit unclear which one to read. As it happens, Lean UX: Applying Lean Principles to Improve User Experience is more about how to apply lean principles to UX design, with an eye toward migrating from a non-iterative UX process to a more iterative, lean, agile process. That book seemed to be geared more toward UX professionals, though anyone who touches UX could benefit from it. Lean UX for Startups addresses the needs of entrepreneurs and members of a startup who want to have a good UX, but can't waste a lot of time and effort on it. I'd reccommend that either individual get both books. But if you are building a startup, this one will give you the most actionable advice quickly. You can benefit from reading both books. If you want to read one on UX, you might get more out of the Lean UX book. And maybe read Lean Startup or perhaps the Pumpkin Plan. This book will add information so it is worth a read. The four books I mentioned would be a good addition to the library of anyone who is starting a business and wants to deliver value quickly.